So I have a problem metabolizing glucose and things that easily turn into glucose (carbohydrates). According to Dr. Joseph Kraft, an American pathologist who has performed over 14,000 insulin assays on patients, almost 85% of the American population share this problem with me in varying degrees although I am at the extreme end of that spectrum. There is an easy way to tell if you share my problem. 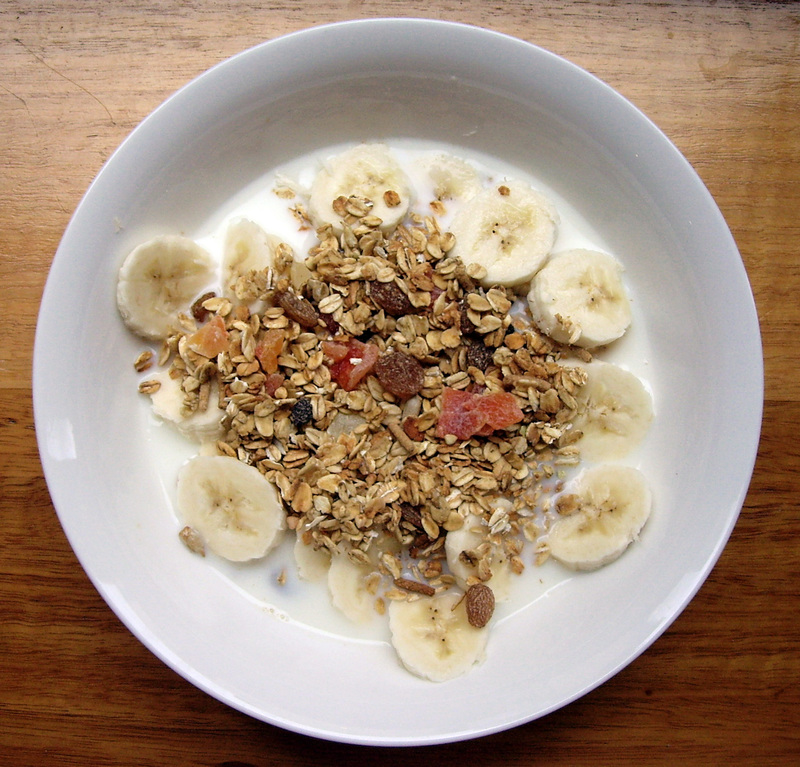 Let’s say you have a big carby breakfast like Muesli with low-fat Yogurt and a little fruit. If about 3 hours after eating breakfast you find you are still feeling a post-meal brain fog that persists until you’ve had your morning tea with a cookie or a mid-morning snack – then you may have trouble metabolizing glucose. So what happens when you eat sugars or starches? The first metabolism happens in your mouth. You secrete in your saliva an enzyme called amylase that is responsible for breaking starches into glucose. Simple sugars start making their way directly into your blood through capillaries in your mouth within seconds. Your brain learns pretty quickly the types of food that give you a rapid increase in energy which is why when we have low blood sugar we know instinctively that we need any food that we’ve had in the past that raised blood glucose that quickly – it’s part of the hedonic nature of carbohydrates. Your food eventually makes it’s way to your stomach where it most of the digestive action is focussed on using stomach acid and enzymes to break proteins into amino acids that can be absorbed through the stomach lining into the blood supply. Finally your food hits your small intestine where more enzymes break food down further – here for example sucrase cracks sucrose into its components glucose and fructose and lactase cracks lactose into glucose and another simple sugar called galactase. Most of the absorption of simple sugars into the blood occurs in the small intestine. All of your cells can use glucose for energy, some like red blood cells can only ferment that glucose to make energy, some like cells in the brain, cornea, liver, kidneys, intestines or pancreas can absorb glucose directly for aerobic glycolysis. However most of the rest of the cells in your body require Insulin to uptake glucose which they then use for aerobic glycolysis. When your Pancreas sees that you have glucose in your blood (let’s say you ate that dish of Muesli) it quickly creates a big spike of a hormone called Insulin, which is used to carry that glucose into your cells so they can burn it for energy. Once your cells have all the energy they need for whatever they are doing right now, they can then store a little glucose inside a starch they make called glycogen. After that all of the remaining excess glucose goes to your liver to be turned into fat for storage. 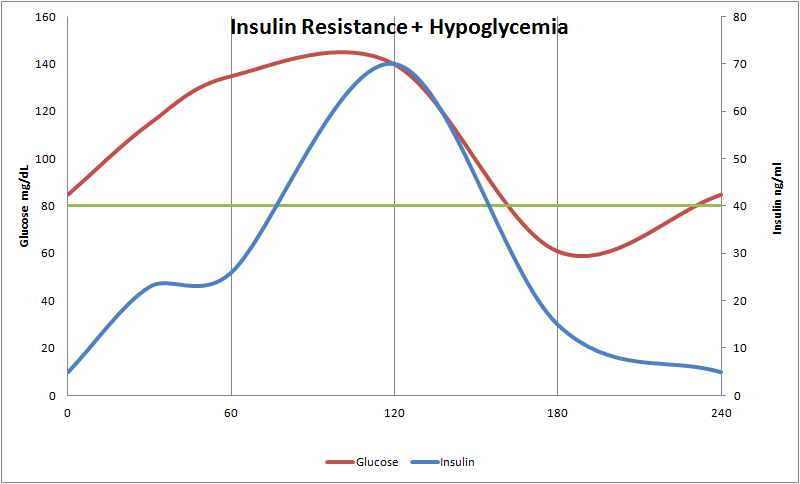 In normal healthy people your glucose (red) goes up, and insulin (blue) quickly goes up in response. 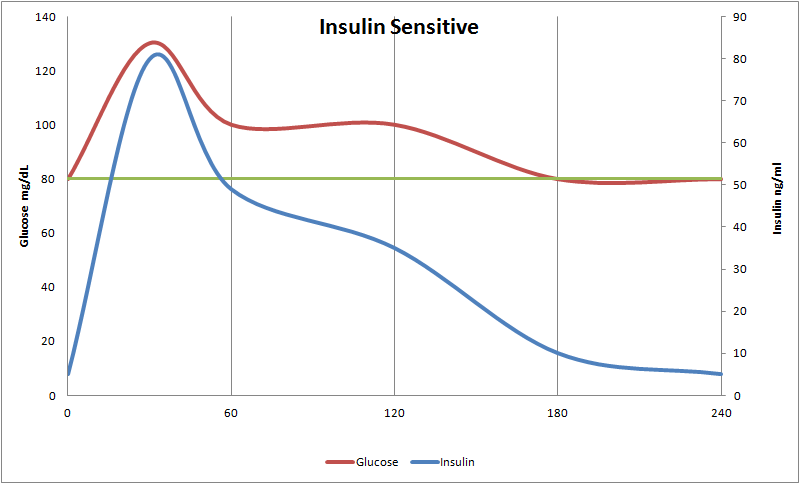 Your body quickly responds to the insulin and draws down glucose levels (red) in your blood back down to normal levels (green line). Once your insulin level has dropped, you then can start using some of the storage energy in your fat reserves. What happens for people who are Insulin resistant like me, is that our Pancreases make Insulin too slowly, our bodies don’t really respond quickly to insulin. Since glucose is still high, the Pancreas makes more insulin, and now there is a lot of insulin sloshing about and when the bodies cells finally get around to using it they over correct and take too much glucose out of the blood – and now alarm bells are going off in the Brain warning that we need to get a snickers bar STAT or we’re going to go into a coma. Doctors call this HypoGlycemia – but you probably know this as “Dude. 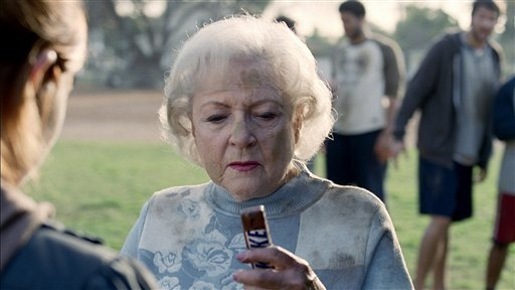 Eat a snickers bar, because you’re not you when you’re hungry”. This is the problem for type 2 diabetics, our ability to reduce dangerously high levels of glucose by selectively releasing Insulin is damaged and the longer we go producing a lot of insulin the more resistant we become and the more we make … and eventually this becomes pathological and we become very sick. Chronic High levels of insulin are bad. If you are willing to sacrifice a dog you can pump insulin into one femoral artery and all the arteries down that leg will quickly become atheroscletotic. Effect of Intra-arterial Insulin on Tissue Cholesterol and Fatty Acids in Alloxan-Diabetic Dogs. Amputation: HbA1c and lower-extremity amputation risk in low-income patients with diabetes. More Cancer: Does cancer risk increase with HbA1c, independent of diabetes? So you know that you need to keep blood glucose in a safe zone. Too little and your brain runs out of energy and you turn into Betty White and eventually go into a coma and die, too much and you can do permanent damage your organs. You know that you get glucose from eating carbohydrates, but it is such an important nutrient that you can also make it. Your liver will make glucose from amino acids that you eat as protein, or from part of the breakdown of triglycerides being burned for fuel. And this is important because in the absence of a safe method of controlling glucose by clearing it we can also make it on demand and this provides a backup method of safely keeping the glucose in our blood at a safe level. If you can limit the glucose in your blood to just that made by your liver, it will make some whenever your blood sugar is low. And that is the critical thing – for type 2 diabetics on a low carb diet – we can safely maintain our blood glucose by making it whenever it is low and trusting our slow moving insulin response system to eventually make sure that that glucose gets into cells which need it. If we eat many carbs we’ll overwhelm this system and we’ll be back to having to deal with an excess of glucose in a body that can poorly respond. But if we eat the barest minimum of incidental carbohydrates and rely upon our livers to make the stuff … we can dramatically lower the risk of losing a leg, or kidney, or eyesight, getting cancer and/or a heart attack.